I got my L’Occitane Immortelle Foaming Cleanser about 2 months ago and have been using it for about that length of time. I usually try to use skincare for a longer time to get a better gauge of it before I can give a proper review. So, what do I think about my first L’Occitane skincare purchase? I surprisingly, rather like it! I like the packaging and the idea of using a foaming cleanser. The packaging comes in a translucent blue plastic bottle with a pump dispenser. The translucent body makes it easy to see how much of the product is left, which I like. At least I know when I should be repurchasing, rather than waiting till there’s nothing left and then getting a horrid surprise in the morning. The cleanser in the bottle is very liquid. In fact, it looks just like water and it sloshes around just like water too. It doesn’t look viscous like most cleansers do. When pumped out, it comes out in the form of a foam hence its name – Foaming Cleanser. The foam is very soft and I find that 1 pump is about right to cover my whole face. I love the smell of the Immortelle Foaming Cleanser. It has a very fresh citrus smell which is just lovely in the mornings. I use this cleanser only in the mornings and it does wonders to wake me up. The foam cleans without drying and once I wash it off and pat my face dry, my skin feels soft and smooth. There is no dry pulling feel to the skin and that alone gets this cleanser the thumbs up from me. The name of the cleanser seems to indicate that it has brightening qualities. I’d have to say I did not notice much of the brightening effect. Then again, I don’t really believe that a mere cleanser can do much to brighten the skin anyway. After all, it is something you wash off and don’t leave on the skin long enough for any brightening effect to take place! 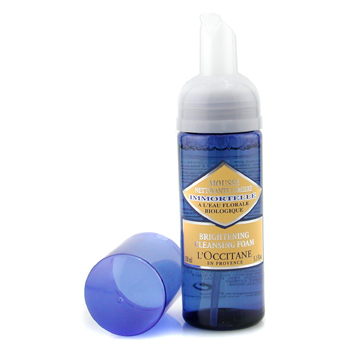 I have nothing really bad to say about the performance of the L’Occitane Brightening Foaming Cleanser. After about 2 months of continued use about once a day on average (sometimes twice a day) I have only used less than a third of the bottle which surprised me. I thought I’d been using more. If there’s one drawback to this product, its the price. The L’Occitane Immortelle Harvest Brightening Cleansing Foam retails at L’Occitane stores in Kuala Lumpur for RM103 (+- US$32+) a bottle. Its really steep for a cleanser. I bought mine online at StrawberryNET.com for US$28 (RM90)! Its not huge savings, but its good enough for me, in addition to the loyalty and extra discounts you get from them. I’m definitely looking at a re-purchase of this cleanser once its used up! euwww… RM103 here? huhuhu so expensive for a cleanser..! yes better buy at strawberrynet.com, as we got free shipping as well..! I liked this quite a bit but it’s expensive! The packaging is a plus point I agree. And I like the foam a lot! Maria: Yes, very expensive for a cleanser but its really good. Sesame: Its truly expensive, so I’m dreading the day it runs out! Sounds promising, maybe I will give this a try some day. I’m a sucker for things that smell natural 😉 As for the price, I think nothing is more ex than the Dermalogica stuff I use! But I do get a giant pump bottle. Monstro: This one isn’t a giant bottle but the smell’s addictive! I didn’t do anything to the site. Most puzzling. Nikki: 2 faces would send most of us into financial trouble LOL… But yes this one’s lovely and I’d repurchase if I had the funds. hi Paris.. i love your site !! really informative in giving out info on beauty products. btw.. could u pls review other products from the immortelle range such as the precious cream, precious fluid, cream mask etc… i heard they’re quite good too..
another thing, could you pls recommend any product that can reduce acne scar? i have acne scar and it is quite visible since i am fair. it is not the “moon surface” type of scar, more to dark spots on the cheek.. if i take picts it will be quite visible. pls help. tq !! Btw, I’m going on a treasure hunt this weekend and Immortelle is my team’s name! LOLOL. hehehehehe i knew that u would love it, PB!! really smooth huh?? the one and only cleanser which not pulling up my face skin after washed. i admit it’s expensive…but it lasts for 4 months!! Syafinaz: Welcome! I have heard good things about the rest of the Immortelle range too. However, the budget doesn’t allow me to try them all. For scarring, there’s nothing instant. I use pure Vitamin E and it helps fade marks somewhat over time. Do look up my previous review for pure vitamin E.
Rinnah: That is a lovely team name! Good luck on the treasure hunt! is strawberrynet really ship goods to malaysia for free? Liz: The prices vary so please check and compare with the store and online. You might want to read my other review on Strawberrynet. yea, I am using this cleanser too, it lasts me for 10 months. 1 pump for once, and I use it twice in a day. I love it very much, and i see the brightening effects after 10 months.I am having a combination skin. It is worth the bucks.